RunGunJumpGun started off as a fun parting gift to an old workplace. The team behind the popular indie game met while working at a local marketing firm. 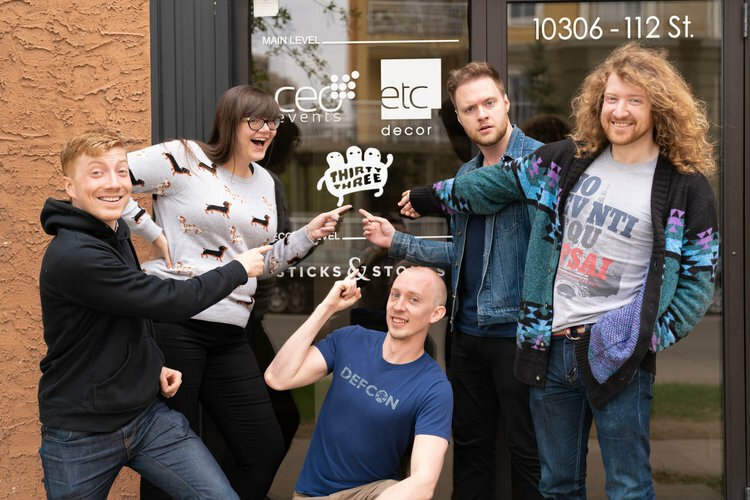 When it was time for programmer Logan Gilmour and artist Matt Satchwill to move on from the company, they wanted to do something special for their co-workers. “Originally it was going to be this super simple thing — just, you know, maybe stick our co-workers' faces on the characters so they can play as themselves. Just a totally tiny stupid game,” explains Gilmour, co-founder of Edmonton-based game design studio, ThirtyThree Games. But when they came up with an innovative twist on a classic Nintendo-style platformer they realized they were on to something much bigger than a simple gag game. In RunGunJumpGun, players navigate a post-apocalyptic world using one button to shoot forward and destroy obstacles, and the other to blast down and float across gaps and trap-laden hallways. The pair decided to demo the game at GDX Edmonton, a game development conference put on by Walk Through Entertainment. They also brought on friend and former colleague Jordan Bloemen to work on music and storyline. Still, the game wasn’t quite there. Initially conceived as a strategic game, it felt slow and plodding, until Satchwill, an artist, decided to mess around with the code. big mess. But in a great way,” says Gilmour, who acts as the main programmer at ThirtyThree. Speeding up gameplay gave way to the pulsing, energetic, reaction-based game available for download on Android and iOS today. A big hit at GDX 2015, the team moved into Startup Edmonton and spent the rest of the summer polishing up the game for initial release on the PC game distribution platform Steam. Though the game didn’t get great pickup on Steam, the team (somewhat begrudgingly) persevered, and the next time the game was released, things went differently. Apple selected RunGunJumpGun for Editor’s Choice, which places highlighted games front and centre in the Apple digital storefront, when it was released on iOS in November 2016. But the real turning point was when the studio’s production company, Good Shepherd, secured RunGunJumpGun a spot in Amazon’s new Twitch Prime package. The deal finally made the company profitable, which is no small feat for an indie gaming studio. These days, ThirtyThree Games is busy developing an interactive virtual reality game using the Oculus Touch Controller. Having successfully applied to the Canadian Media Fund the company has expanded to include another programmer and a designer/production manager, who hopes to keep the haphazardness to a minimum.